Go it alone or tag in a family member for co-op in this dungeon dive. Just remember: You'll always have a home to respawn in. Rogue-lites are a dime a dozen these days, not to say that there aren’t quality experiences, but there are tons of titles to sift through. It takes some marketing genius and a little bit of luck to make them stand out, but some are simply appealing immediately. Children of Morta is one of those games. In this game from Dead Mage, the selectable characters are all from the same family. The bloodline has a long history of powerful mages, warriors, and any other fantasy class archetype you can imagine and each family member takes on one of the roles. The father, for instance, is the brute tank of the family with sword and shield in tow, while his younger daughter has followed in the footsteps of her grandmother and enters dungeons with fire magic. In my demo, I chose to play as the younger daughter. She can’t take a lot of damage before falling, but she can deal a good bit of her own from a distance. She casts fireballs in whatever direction you point, but you’ll be vulnerable while attacking because she stands still. The tradeoff, though, is that she’ll cast even more rapidly the longer you maintain the attack. She was also able to cast a decoy that enemies would be drawn to or cast a damage-over-time tornado that chips away at enemies that pass through it. I did fairly well with here, but large hordes started to wear me down. 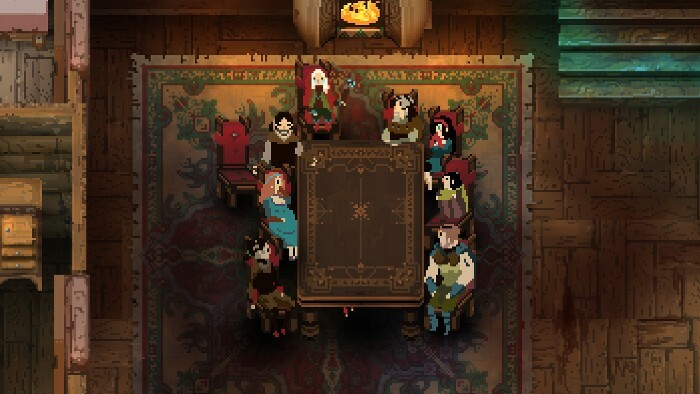 Thankfully, Children of Morta is also co-op. There are no super abilities that you unlock with different pairings but, because each family member is so specialized, they can complement each other well. The father and younger daughter were the only ones available for the demo, but are a great team. The father can draw in the hordes and keep them at bay with his shield, while his daughter destroys them wave after wave with her magic. The oldest daughter plays like a bard, the brooding older son is a monk, their cousin, who’s the son of the their uncle who’s also the family blacksmith, is an offensive character that fights with a hammer much like Thor, and the youngest brother is a thief. The mother is pregnant during the game’s story, something I was told plays a part in the narrative, but she’s unplayable as is the grandmother. Grandma has a Yoda-like moment at some point in the story, I’m told, but I was personally disappointed she wasn’t a playable character. DLC maybe? We’ll have to wait until later in 2018 to find out.